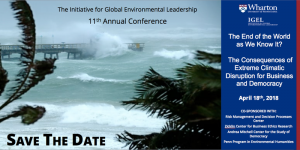 In April 2018 I got a chance to speak at the “The End of the World as We Know It: The Consequences of Extreme Climate Disruption for Business and Democracy”, Conference with IGEL at the Wharton School at PENN. It was a great opportunity to hear an interesting mix of academic and private sector speakers. From many of the speakers the message was – “change is coming, embrace it, and maybe even benefit from what is happening.” This is a positive message that I try to encourage with my own clients. I tell them, look at current conditions, this is not the world we lived in 10 years ago! We need to think and plan differently. The public and private sectors each bring important talents, experience and resources to the table. Coordination and collaboration are key to creating a resilient community and nation. Open dialog needs to start years before the next big event – last minute decision-making does not produce good outcomes. Many cities have public-private planning coordinators within their Office of Emergency Management – this is a great place to start the conversation. I tell this to anyone that will listen…. Personal preparedness for you and your family is critical – a shelter-in-place plan, a communication plan, a Go-Bag for evacuation (and a pet plan if needed) are the basis for community or business preparedness. Look for county resources at your local Office of Emergency Management and visit www.ready.gov for straightforward advice and recommendations. Let’s remember that we live in a country with old, fragile and out-of-date infrastructure. The bridges we need for evacuation are decaying; the schools we need for shelters are old and leak during an average rainstorm. To increasing our resilience, we need to plan smart, think about future climate conditions and rebuild our infrastructure to support our emergency response needs. Along with our physical infrastructure the nation must work to increase the resilience of our citizens. We must raise the standard of living for Americans, pay a living wage and seek social equity. We must have a health systems the promote wellness, fiscal education and financial institutions that help low income people promote savings, public and private organizations that teach and uphold civil discourse – these and many more idea create communities that can better withstand events and recovery more quickly. And lastly, as we all look to promote the increase in resiliency we need to take every opportunity to push this agenda in public policy and budgeting, and when private companies are impacted. Unfortunately, these pushes tend to come right after an event has affected the nation – after a hurricane, a wildfire, or earthquake. While it may see opportunistic – we must seize these times and push the resilience agenda forward. We know from experience that the public’s attention span is short, and unless action is taken quickly the public’s engagement and interest will fall off, as the news cycle moves forward. Chris Rohner is a business continuity program manager for General Dynamics Information Technology (formerly CSRA). His 25-year background spans emergency management, planning, and response operations, public health, business continuity, community resiliency as well as transportation planning and policy development. He has extensive experience working with local, city, state and regional government agencies and the private sector to find straightforward solutions to complex problems by focusing on clients’ specific circumstances. In the public sector he has held key management positions with the New York City Department of Health and Mental Hygiene (DOHMH), Bureau of Emergency Management; and the New York City Metropolitan Transportation Authority (MTA). In the private sector he has worked as a program manager within the community resilience space at Ecology and Environment, Inc. and at CSRA, now General Dynamics Information Technology. Cary Coglianese is the Edward B. Shils Professor of Law and a professor of political science at the University of Pennsylvania and the founding director of the Penn Program on Regulation. Daniel Walters is a Regulation Fellow with the Penn Program on Regulation at Penn Law. What might the EPA look like without current Administrator Scott Pruitt? Two regulatory experts discuss the future direction of the agency. EPA Administrator Scott Pruitt has come under bipartisan fire for an array of ethical missteps that range from lavish spending on travel to the granting of illegal pay raises for select EPA staffers. Over the past week, staunch Pruitt supporters such as Senate Environment and Public Works Chairman John Barrasso have questioned the transparency with which Pruitt has run his office, and legislators from both sides of the aisle have suggested that Pruitt may not be fit to lead the agency. Could Pruitt’s tenure at the EPA be coming to an end? And if so, what direction might the embattled agency take under new leadership, such as that of recently confirmed Deputy EPA Administrator Andrew Wheeler? In this special episode of Energy Policy Now, Penn Law energy and environment legal experts Cary Coglianese and Daniel Walters discuss the swirl of possible ethical violations that have led to the Pruitt controversy. They explore what Pruitt’s departure could mean for his efforts—and those of the Trump administration—to deprioritize environmental protection at the EPA and roll back environmental regulations. The Energy Policy Now podcast, now in its second season, offers insights from Penn experts, industry and policy leaders on the energy industry and its relationship to environment and society. On Wednesday, April 18th, a fabulous group of interdisciplinary stakeholders came together on the 8th floor of Jon M. Huntsman hall for a day of knowledge sharing and thought leadership about how business and democracy will be impacted by climate change. Our panelists ranged from a global manufacturer of consumer products, to a leading global advisory, broking and solutions company, to one of the world’s largest utility providers, to experts in atmospheric and oceanic sciences, to Navy veterans and business continuity consultants. Margaret Leinen, Director of Scripps Institution of Oceanography, concluded the day on an upbeat note – weaving together all of the key lessons from panelists and leaving the audience with the knowledge that, despite the enormous task in front of us, we have experts at all points of a complex system working to adapt, mitigate and build resilience for a future that often seems daunting. Nothing changes overnight, nor does it happen in a vacuum. Continued interdisciplinary collaboration and a systems-oriented approach are critical to making an impact. Thus, today – the 48th celebration of Earth Day – we would like to thank all of our sponsors and stakeholders at IGEL for their commitment to making this world a better place for everyone and everything. There are clear signals that the climate has changed over the past century. Around the world, people are beginning to feel the effects, from increased average and extreme temperatures, to changes in rainfall patterns, to more severe and less predictable storms. At Mars, we source key agricultural materials from countries and communities that are vulnerable to the impacts of climate change. We believe it’s time to take a new approach to addressing this challenge, using our influence and reach to take action that proactively addresses the impacts of climate change within our supply chain and operations. Here are three things our business and others are doing to take action. More than 97 percent of actively publishing climate scientists agreehuman activity is extremely likely to be causing the climate-warming trends over the last century. To avoid the worst consequences of climate change, science tells us we should limit global warming to less than the two degree Celsius threshold outlined in the Paris Agreement on climate change. As the saying goes, you can’t manage what you don’t measure. With that in mind, the first thing business should do is trust the science; then align measurable goals and actions around that science. We looked to the best-available science to guide us in setting our climate goals at Mars. That science says we must reduce the total greenhouse gas (GHG) emissions across our value chain by 27 percent by 2025 and by 67 percent by 2050(from 2015 levels). That means not only changing how we operate, but also working with partners and suppliers to transform entire value chains so that the ingredients we need to make our best-loved products, like M&Ms and Uncle Bens, are produced with lower environmental impacts. This isn’t an easy goal to meet. But we know it’s what’s necessary to unlock the systemic changes that are needed to benefit people and the planet. The second thing business should do is look for the places where we can get the most immediate momentum and leverage that momentum for scale. At Mars, energy use is the major driver of our GHG emissions from direct operations. That’s whywe’re big fans of renewable electricity with a goal to eliminate 100 percent of the GHG emissions from our direct operations by 2040. This goal covers the energy use from about 420 sites in more than 80 countries around the world. We’re already using or purchasing renewable electricity to cover 100 percent of our operations in Belgium, Lithuania, the United Kingdom and the United States. And in 2018, we plan to add Austria, the Czech Republic, France, Mexico, Poland and Spain to this list.In addition to renewable electricity, renewable thermal energy is an important part of our energy use in our factories. For that reason, we helped launch the Renewable Thermal Collaborative – a coalition for organizations that are committed to scaling up renewable heating and cooling at their facilities and dramatically cutting carbon emissions. The third imperative for business action is to ensure we are aligning what we say with what we do. We need more vocal business advocates for climate action. We are walking this talk through coalitions such as We Are Still In, a declaration made by 2,700 cross-sector leaders in the U.S. to commit to tackling climate change, ensuring a clean energy future and upholding the Paris Agreement. It also can happen through executive advocacy. For example, our Mars chairman, Stephen Badger, recently authored an op/ed piecein The Washington Post,which makes a strong call to action to global businesses on climate change. We also need to extend our advocacy to include the seats of power and influence within government. That’s why we engage with groups like the Ceres BICEP(Business for Innovative Climate and Energy Policy) Network, to bring business leaders’ voices to Capitol Hill and local legislatures on climate action and clean energy. For global businesses, it is our time to step up and lead on climate action. This is not just the “right thing to do,” but also makes good business sense; investing in sustainable practices today will help us become stronger, more resilient businesses in the future. Lisa is Senior Director of Partnerships and Engagement within the sustainability team at Mars, Incorporated. In this role, she works to build momentum for the company’s Sustainable in a Generation Plan through compelling communications and engagements as well as uncommon collaboration. She works with the global sustainability team to create and oversee integrated sustainability strategy; set high-level goals and commitments; assess and drive scaled investments; and manage global sustainability partnerships and programs. Priority platforms for engagement include climate action, water stewardship and land use within Mars’ approach to healthy planet; increasing income, respecting human rights and unlocking opportunities for women within Mars’ approach to thriving people; and food safety & security, product & ingredient renovation and responsible marketing within Mars’ approach to nourishing wellbeing. Lisa has nearly twenty years of experience working to advance sustainable business growth with consumer goods companies such as Mars and The Coca-Cola Company. Lisa holds a bachelor’s degree in international relations and a master’s degree in higher education administration from the University of Virginia. Outside of work, she collects photography and enjoys golf, tennis and biking. Risks related to climate change are some of the most significant threats facing the global economy, according to the World Economic Forum, which recently released its Global Risks Report 2018. In a report that scans a spectrum of economic, environmental, geopolitical, societal, and technological risks, extreme weather events, natural disasters, and failure to mitigate climate change took three of the Top 5 risks likely to have an impact on the global economy in the short term. 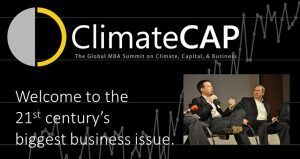 Fuqua is one of 16 business schools collaborating to host an event on March 23-24 called ClimateCAP: The Global MBA Summit on Climate, Capital, & Business. Its speakers will include executives from JPMorgan Chase, Goldman Sachs, Nike, Bain & Co., Morgan Stanley, Levi Strauss, KPMG, and other big-name private sector leaders. The summit will be held on Fuqua’s campus in Durham, NC, but will rotate to another business school in future years. “This summit is not about politics. It’s not about policy. It’s about which businesses and investors will successfully navigate a more turbulent future because they’ve identified these risks and adapted accordingly—and which will be left flat-footed,” adds Vermeer. Statoil, the Norwegian oil and gas company, is one example of a company that’s not shying away from recognizing the risks on the horizon. “In Statoil we believe the winners in the energy transition will be the producers that can deliver energy at low cost and low carbon. That is why we work to reduce own emissions, grow in renewables and embed climate in all our decision-making,” says Bjørn Otto Sverdrup, Senior Vice President of Sustainability at Statoil. Sverdrup will be speaking at the summit and hopes to help MBA students better understand the profound strategic challenges and opportunities climate issues represent for companies. In 2017, Columbia Business School organized an event on “The Near-Term Impacts of Climate Change on Investors” and Yale School of Management also co-hosted a conference on climate change. Featuring Daniel Raimi is a senior research associate at Resources for the Future, where he focuses on energy and climate policy. He also teaches energy policy at the Gerald R. Ford School of Public Policy at the University of Michigan, and is a faculty affiliate at the University of Michigan Energy Institute. The view of Americans on the environmental and economic implications of fracking continues to be sharply divided a decade after the shale revolution began. But the author of a new book, The Fracking Debate, finds more nuanced perspectives in wellhead communities. The shale revolution in the United States is now more than a decade old. In the intervening years, energy companies have tapped vast, previously uneconomical oil and natural gas resources through a suite of technologies, including hydraulic fracturing, commonly called fracking, and horizontal drilling. The results have been dramatic. Today the U.S. is a leading producer of oil, and the top global supplier of natural gas. But the shale revolution has also bred controversy as the country has struggled to balance fracking’s economic and environmental impacts. Those for and against fracking have often gone to great lengths to promote their views. Along the way, previously quiet communities, from Pennsylvania to North Dakota, have struggled to accommodate waves of drilling rigs and energy workers. Guest Daniel Raimi spent several years traveling the country to get to know the communities where fracking takes place. His travels led to a new book, The Fracking Debate: The Risks, Benefits, and Uncertainties of the Shale Revolution. In it Raimi seeks to relate the perspective of communities, and citizens, on fracking’s front lines, and provide unbiased answers to some of the biggest questions surrounding fracking. IS THIS THE FINAL GOODBYE TO MY CHILDHOOD? On a bright Sunday afternoon, a long time ago, a young girl, about 10 years old, jogged along a quiet street with a robust and large Labrador retriever leading her. Her father walked behind laughing merrily at the duo’s silly antics. “Scruffy!” she yelled in desperation, praying that her arm wouldn’t pop out of its socket with the leash strapped on to it. The large dog halted and started sniffing a patch of green grass, just as he always did. She quickly handed the leash to her father and slipped her hand into his warm, loving one. The little girl loved this routine; especially the cool shade that the trees on the street provided her. She loved the perfect arch that the trees made, creating a tunnel of lush green in a myriad of hues. The spectacle of the Gulmohar tree during summer engulfed by fiery red flowers which would later fall, creating a “red” carpet, of sorts was indeed a sight to behold! That perfect story was my childhood. I grew up in a quiet, peaceful city called Mysore (Mysuru now). Mysore: with its awe-inspiring Chamundi Hills, its historic architecture in the form of the Mysore Palace, and its renowned zoo: the Sri Chamarajendra Zoological Gardens, is a world-famous heritage city. The city has always had an old-world charm to it. It is a mix of the colonial world with the architecture of the Rajas of India. It is surrounded by National Parks and Wildlife Sanctuaries and is very close to the famous Western Ghats. Among all of the things that I admired about this city, the one thing that I prized was its weather. Of course, like any normal city, there was monsoon, summer, winter, autumn and spring. However, none of these seasons had extremes and thus we always enjoyed a pleasant climate all through the year. Fast forward to today: I have read articles almost every summer of “The Highest Temperature” being recorded through the history of summers. I have seen the KRS Dam Reservoir: Mysore, the nearby Mandya and Bangalore’s major source of water, plunging into oblivion due to delayed monsoons. So much so, that the headlines in local newspapers were pictures of an omelet being made directly on the scalding tar roads of the city! Most importantly, I too have personally felt the changes: I have seen the extremes that I prided Mysore for never having. With all of these changes that are slowly and subtly occurring, I wonder if it is our fault. My beautiful tunnel of trees, one that I cherished as a child, and one that I knew had the supernatural ability to secure and protect me, the one that was the reason my parents bought our house, “Blossom” now just remains a pocket of trees outside my house. All of the other trees have vanished; brutally chopped because they were causing problems with overhead communication signals. The birds that flocked my street and filled the air with their musical sounds have been silenced. Scruffy does not pause to sniff anymore. The street increasingly looks barren, as do other parts of the city. Does development mean a goodbye to nature? Can development not occur sustainably, hand-in-hand with the environment? And most importantly, is this the end of my childhood? 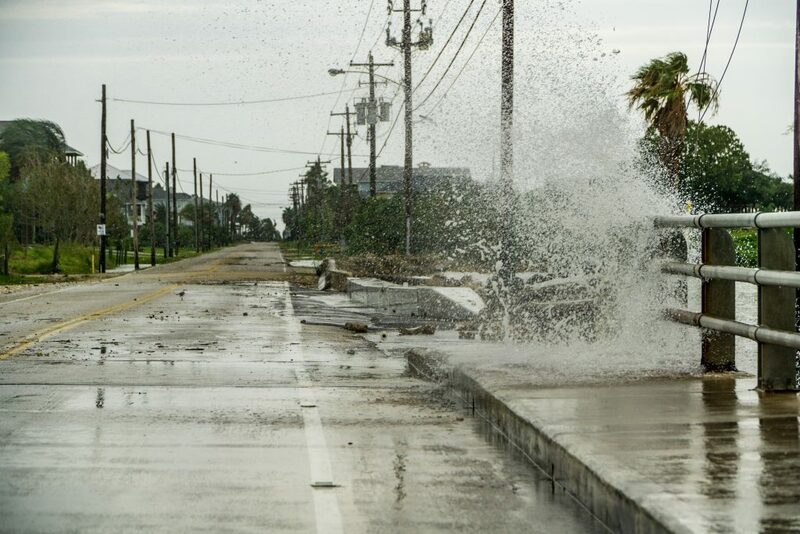 Hurricane Harvey – More exposures in the mix than just water and wind! Historic/Pre-Existing Contamination – Properties having historical or pre-existing contamination could be disturbed and, subsequently, carry pollutants to multiple locations resulting in the cross-contamination of various parts of the property and/or neighboring properties. Landfill Containment Breaches – Heavy water infiltration can cause landslides carrying with it pollutants and/or contaminated waste water into nearby waterways or sensitive third-party receptor areas. Floating Drums of Chemicals and Storage Tanks – Drums containing hazardous waste and storage tanks containing oils and other chemicals could be raised afloat and damaged during transport from their original locations, thereby distributing pollutants downstream. Sewerage Authorities System Back-ups – Sewerage authorities have limited storage and processing capacity, therefore, large unanticipated volumes of water could result in the overflow and/or release of raw untreated sewage. Mold Damage – Mold can grow at alarming rates given proper moisture, temperature range and food source (cellulose-based substrate) following a saturation event. While property policies may include some pollution-related coverage, it’s imperative that insureds, if they have environmental insurance policies, place their carriers on notice, carefully follow the environmental claim reporting instructions and fully understand any “emergency response” coverage provisions and policy nuances. It’s prudent for insureds to report their environmental claim to their carriers immediately. If cost estimates for remedial activities are available, they should be sent to the carrier for approval. When submitting proposals, request that the carrier approve the costs as “reasonable and necessary” pending a coverage determination. This piece was originally posted as an op-ed for the Willis Towers Watson Wire. That article can be found here. Anthony is a Executive Vice President and the National Sales Leader for Willis Towers Watson’s Environmental practice based in New York. He has close to 20 years of experience from a regulatory, underwriting and brokerage perspective. He blogs on matters relating to environmental risk, exposures and insurance. The new episode is a conversation with a former State Department climate negotiator who was involved in the Paris climate deal. He discusses the current White House debate around Paris, and the implications for global climate cooperation if the U.S. backs out. The Trump administration has offered conflicting messages on its intention to remain a party to the 2015 Paris Climate Accord. The question of U.S. involvement reaches a climax this week as senior advisers to the President hash out the administration’s path forward, with potentially far reaching implications for the climate deal, and for the United States’ role as a steady leader in global diplomacy. In the latest episode of the Kleinman Center for Energy Policy’s Energy Policy Now podcast, former State Department climate negotiator Andrew Light discusses the battle in the White House over Paris, and the fate of the accord without U.S. leadership. Light, a recent visiting scholar to the Kleinman Center, examines whether it will be possible for the U.S. to meaningfully “maintain its seat at the table” of climate dialogue even as it pulls back from global climate efforts. Light also provides insights into the negotiations leading to the Paris climate deal, and the unique political environment in the U.S. and abroad that made the agreement possible. Light is a Distinguished Senior Fellow in the Global Climate Program at the World Resources Institute and Director of the Institute for Philosophy and Public Policy at George Mason University. Thomas Jefferson was a very smart man. Perhaps though, his view of the purpose of government has been lost over time. Recently there has been much discussion on the economic damages inflicted by the federal government related to the regulatory burden that industry faces in the United States. Although these discussions are not solely limited to environmental regulatory burdens, many do believe that the pendulum has swung too far in controlling industrial operations and their air, water, and waste discharges. I am not one of those individuals. Yes, the Cuyahoga River in Cleveland no longer catches fire. And Pittsburgh’s success as a city is no longer defined by the smoke being emitted from the stacks of its steel industry plants. And the hidden Love Canal surprises are hopefully behind us. Yet, there continues to be noteworthy cases of major environmental incidents and non-compliances across the nation. The 2015 Volkswagen “clean diesel” scandal is only one of many. Did you know that every single year for the past 20 years the U.S. Department of Justice has charged some 200 to 300 individuals with committing environmental crimes? That might not seem like many but in total these are criminal charges against over 5,000 individuals, not simply civil charges for exceeding permit limits or discharge standards. One could logically ask the question – Where does the U.S. stand today with regard to environmental regulations and enforcement as the country experiences a new presidential administration with an uncertain regulatory philosophy and strategy? Are we indeed better off and is it time to take the foot off the gas or is there still much work that needs to be done? Recent regulatory and enforcement data released by the U.S. EPA help us to better understand where we are presently as a country and where we might be headed. The First Earth Day occurred on April 22, 1970 in the midst of a nationwide college campus strike protesting the Vietnam War. Protests in the streets all over the land. Hmmm… Sound familiar? That year of 1970 became a springboard for the passing of major federal environmental laws in the U.S. As shown in Table 1, in the next two decades, some 12 critically important environmental, health and safety laws were passed. Interestingly enough, eleven of the twelve were authorized and signed by Republican presidents; a legacy that is sometimes forgotten or ignored. Each law, of course, required the creation of regulations to accomplish the stated goals. And indeed that has occurred. All federal regulations, including those created by the EPA, are codified in the Code of Federal Regulations (CFR), published annually by the Government Printing Office. That is, each year the CFR is released to the public and it contains all current and updated regulations effective on July 1st of that year. The individual volumes for each year are usually available in January or February of the following year. The EPA is responsible for the 37 volumes of Title 40 of that Code. By early 2017 the EPA had released the 2016 CFRs effective July 1, 2016. The total page count for EPA’s Title 40 regulations in 2016 was 27,074, the most on record. (See Figure 1) Combined with OSHA’s 3,096 pages in Title 29 there were, for the first time, over 30,000 pages in total, with EPA regulations accounting for 90% of that total. Recent Growth. There was an approximately 800 page, or 3%, increase in the number of pages in Title 40 in 2016. This increase was almost twice as large as the total page count in 1972, the first year of regulatory codification. Distribution by Media. Approximately 66% of the pages in Title 40 are devoted to Clean Air Act regulations. This represents roughly 17,750 pages, meaning that the Clean Air Act alone has almost six times as many pages of regulations than all of OSHA’s Title 29 Code. Comparison with the U.S. Tax Code. By comparison, the 30 thousand pages of EHS regulations is only about 40% of the total page count of ~75,000 pages in the federal tax code. Comparison with the Dow. Interestingly, if one does the calculations for the 1972-2016 period, there is a 95% statistical correlation between the growth of environmental regulations and the growth of the Dow Jones Industrial Average (DJIA). Granted this is some outside-the-box thinking, but could this mean that regulatory growth is good for the economy!? Will Environmental Regulations Continue to Grow? Will the growth of federal environmental regulations continue or has it peaked? One way to anticipate the answer to the regulatory growth question is to take a look at the Agency’s Semi-Annual Regulatory Agenda, which was last released on November 17, 2016 (as part of the Executive Branch’s Unified Agenda) in the Federal Register. This is a spring and fall requirement for all regulatory agencies[i]. In November the EPA listed 203 additional regulations (not pages, but individual regulations) that either had been recently promulgated (but not yet codified) or were under development. Eventually, all of these new regulations will be added to Title 40, continuing the growth, unless there is a concerted effort to halt the regulatory development process; more on that later in this chapter. It is very interesting to note, as depicted in Figure 2, that each of EPA’s Semi-Annual Regulatory Agendas from 1999 to 2011 listed somewhere between 350 and 450 regulations under development, a consistency that is stunning. This means that for over a decade, there were always around 400 regulations under development on the docket. Interestingly, there has been a dramatic reduction in the number of regulations listed to roughly 200 from years 2012 to 2016. Maybe the regulatory pipeline is beginning to empty. Water Storage Tanks. For large firewater and other water supply above-ground storage tanks, there is no requirement for tank integrity testing or secondary containment protections. These tanks are often located adjacent to electrical substations and transformers in utility areas where a tank breach could short out the entire electrical system of the site and possibly the surrounding community. And history tells us that large volumes of unexpected water releases can do considerable damage to facility equipment. In 2011 a tsunami disabled the backup generators at the Fukushima, Japan nuclear power plant resulting in a meltdown of three nuclear reactors. One global consumer products company has recognized this water storage issue as an unacceptable risk and has developed a corporate standard that requires secondary containment for all above ground storage tanks worldwide. Hazardous Waste Storage. Hazardous waste stored at 90-day accumulation areas require only that drums and containers be labeled, physically intact, and inspected weekly. Surprisingly there is no federal requirement that containers be placed on an impervious surface incorporating secondary containment protections. Thus, a pretty much unlimited amount of containers and drums holding hazardous waste can be stored directly on the ground for up to 3 months at these locations. Several states, including Massachusetts, have recognized this as a gap and require additional protections such as secondary containment for accumulations areas. Accidental Discharges of Hazardous Substances. Spill Prevention, Control and Countermeasure (SPCC) Planning requirements promulgated under Section 112.7 of the Clean Water Act regulations are designed to prevent the accidental release of only oil-containing substances into the nation’s waters. Facilities subject to the regulations must develop an SPCC Plan that is certified by a Professional Engineer and must provide appropriate containment and/or diversionary structures or equipment to prevent a discharge of oil. New Jersey is one state that has recognized that regulating only oil in this way is a gap and has promulgated Discharge Prevention, Containment and Countermeasure (DPCC) regulations that cover not only oil but numerous other hazardous substances. There are certainly other gaps as well and also existing regulations that require additional clarification. A great example of the need for clarification are the “weekly”, “monthly”, and “annual” requirements found in many environmental regulations. Be assured that there have been many lively discussions among site staff, regulators and auditors over whether “annual” means every 12 months or once a year. There is a big difference in the two interpretations. The EPA has had a substantial enforcement program throughout its history. EPA’s current Enforcement budget is approximately 10% of its total $8.1 billion budget and, for comparison purposes, is 35% more than the entire budget of the Occupational Safety and Health Administration (OSHA). On December 19th, the EPA released its enforcement results for fiscal year 2016, which ended on September 30, 2016. [ii] Included in those results were data on administrative, civil judicial penalties, and criminal fines assessed. As shown in Figure 3, EPA issued $5.8 billion in civil and criminal penalties in FY2016, the most ever in history. However, the great majority of the penalties issued were due to a $5.6 billion settlement with BP Exploration & Production for Clean Water Act violations stemming from the April 20, 2010 Deepwater Horizon blowout and subsequent oil spill. Note further that the 2013 penalty amount of approximately $2.6 billion was impacted significantly by billion dollar penalties against Transocean and BP, again for the Deepwater Horizon incident. DuPont agrees to pay $50 million in natural resource damages to resolve claims stemming from the release of mercury in the 1930’s and 1940’s from its Waynesboro, VA plant (December 16th). Michigan’s Attorney General brings more criminal charges over the Flint, Michigan water crisis, including felony charges against two former state appointees and two former city officials (December 20th). Volkswagen reaches $1 billion deal with the USDOJ and California in the ongoing diesel emissions scandal (December 21st). A federal jury finds DuPont liable for $2 million in compensatory damages for an individual’s cancer stemming from the dumping of Teflon manufacturing chemicals (C8) into the Ohio River. An additional 3,500 cases are pending (December 21st). Shell Oil will pay $22 million to the city of Clovis, California for chemical (TCP) found in drinking water supply (December 27th). Frankly, it’s hard to believe that all five of these incidents occurred over a two-week period in the last month of 2016. They suggest that the U.S. is nowhere near where it needs to be with respect to the environment. Continuing oversight is needed and both public and private sector institutions need to be held accountable for meeting, if not exceeding, regulatory requirements. During the 2016 presidential campaign and now with the new Trump Administration in place concern has been expressed over the regulatory burden placed on U.S. industry and the regulated community in general. It should be noted that this concern is nothing new. For example, on January 18, 2011 President Obama issued Executive Order 13563, “Improving Regulation and Regulatory Review”. The Order required a government-wide review of existing rules “to remove outdated regulations that stifle job creation and make our economy less competitive. It’s a review that will help bring order to regulations that have become a patchwork of overlapping rules…”[iv] In response to President Obama’s Executive Order, EPA created the Regulatory Development and Retrospective Review Tracker (Reg DaRRT), which provides information on the status of EPA’s priority rulemakings, as well as information on the status of retrospective reviews of existing regulations. One positive outcome of the Executive Order was the July 31, 2013 issuance of a final EPA rule on solvent-contaminated wipes that reduced the regulatory burden on tens of thousands of facilities using these wipes routinely. What is different today is the approach that is being proposed by the current Administration. President Trump has said numerous times that his goal is to eliminate as many as 75% of all existing federal regulations. The first step in that effort was the January 30, 2017 issuance of an Executive Order: “Reducing Regulation and Controlling Regulatory Costs.” This Order calls for every “one new regulation issued, at least two prior regulations be identified for elimination with the goal of zero incremental costs.” As with most Executive Orders further guidance will be required and the Director of the Office of Management and Budget is required to develop that guidance. In fact, on February 2, 2017 the White House issued guidance stating that the Order would only apply to “significant” regulations, as defined in Executive Order: “Regulatory Planning and Review”, issued by the Clinton Administration in 1993. Significant regulations are those imposing an annual economic cost ≥$100 million. The Director must also identify the total amount of incremental costs that will be allowed for each agency for each fiscal year. This “one in, two out” approach, if enacted as stated, obviously will have significant impacts on federal rulemaking within all agencies including the EPA. As stated previously, the EPA in its November 2016 Semi-Annual Regulatory Agenda listed 203 new regulations under development or review. Will this mean that if all of these regulations are put forward that over 400 other, existing regulations must be eliminated? As arbitrary as this sounds, the answer today is yes. Another potential impact caused by the Executive Order would come from the new chemical requirements in the Frank R. Lautenberg Chemical Safety for the 21st Century Act signed into law on June 22, 2016. The Act requires that the EPA evaluate and communicate the risks of existing chemicals from the current inventory of 83,000 chemicals in use in the U.S. The first 10 chemicals were identified on November 29, 2016 and include asbestos, carbon tetrachloride, methylene chloride, and trichloroethylene. If an assessment determines that a chemical poses an unreasonable risk the Agency must mitigate that risk within two years. Further, for each risk evaluation completed, another must be initiated with at least 20 ongoing evaluations being conducted by the end of 2019. Does this mean that any resultant rule addressing mitigations for a particular high-risk chemical cannot be promulgated unless two other unrelated rules are eliminated? This seems rather arbitrary as well. Perhaps in this and other cases the “significant regulation” threshold will have a moderating impact and the effects will not be as severe as expected. Another regulatory reform initiative taking place but receiving considerably less attention is the use of the Congressional Review Act enacted in 1996, which allows lawmakers to take certain actions for those laws enacted during the waning days of an administration. The Congress has already used this power to rescind EPA’s Stream Protection Rule promulgated in December 2016, which sought to protect the nation’s waterways from debris generated by coal surface mining activities. Congress is also attempting to rescind the EPA’s revised Accidental Release Prevention Requirements contained in its Risk Management Program final rule issued on January 13, 2017. A bill to rescind the rule has been introduced in the House as of this writing. Historically, the Congressional Review Act has been used sparingly but this has not been the case in early 2017. In sum, there is strong evidence that significant regulatory reform is ahead driven by a Republican Congress and Presidency. One can only hope that logic will prevail and that protection of human health and the environment will continue as a fundamental goal for the nation. Nationwide Facility Coverage. Over 800,000 facilities in the U.S. generate air emissions, wastewater, and hazardous waste at a level sufficient to require regulatory oversight through mechanisms such as Title V air permits, NPDES wastewater discharge permits, and/or hazardous waste generation and disposal requirements. That’s an average of 16,000 facilities per state where there is regulatory oversight and controls over the release of pollutants. Hazardous Waste Generation. There are over 26,000 large quantity hazardous waste generators in the U.S., generating over 33 million tons of hazardous waste annually. These generators are required to manage the wastes properly and report to the EPA every other year on their activities. Toxic Releases. There are over 22,000 facilities in the U.S. that release listed toxic chemicals at a sufficient level to require reporting under the Toxics Release Inventory (TRI) requirements of the Emergency Planning and Community Right-to-Know Act. Over 3.3 billion pounds of toxics were released nationally in 2015. TRI reporting has resulted in a better understanding of pollutants in our environment and has driven a reduction over time of releases. Superfund Sites. As a result of the 1980 passage of the Comprehensive Environmental Response, Compensation and Liability Act (CERCLA) some 1,188 “Superfund” sites have been cleaned up as of November 30, 2016. However, there remain 1,337 National Priorities List (NPL) Superfund sites yet to be cleaned up. Toxic Chemicals. There are 85,000 chemicals inventoried and regulated under the Toxics Substances Control Act. These include materials containing asbestos and PCB’s, which were considered “miracle” products when first produced. Very few of the inventoried chemicals have undergone meaningful risk assessments to determine hazards posed to human health or the environment. The Frank R. Lautenberg Chemical Safety for the 21st Century Act signed into law on June 22, 2016 contains provisions to assure that these assessments are conducted. It is important to note that, save for the Superfund sites, all of the chemicals, wastes, releases, and discharges discussed above are being managed in compliance with existing environmental regulations. Do we really want to eliminate 75% of these regulations resulting in fewer controls over discharges and releases? [i] The Regulatory Flexibility Act and Executive Order 12,866 require Spring and Fall Regulatory Agendas. [ii] U.S. Environmental Protection Agency, “Fiscal Year 2016 EPA Enforcement and Compliance Annual Results,” Office of Enforcement and Compliance Assurance, December 19, 2016. [iii] U.S. Environmental Protection Agency, FY 2013 Office of Enforcement and Compliance Assurance (OECA), National Program Manager (NPM) Guidance, April 30, 2012, p. 6. [iv] Obama, Barak, “Toward a 21st-Century Regulatory System”, Wall Street Journal, January 18, 2011.